Fred Phelps Sr., the founder of a small extremist Kansas church who drew international condemnation for outrageous and hate-filled protests that blamed almost everything, including the deaths of AIDS victims and U.S. soldiers, on America’s tolerance for gay people, has died. He was 84. 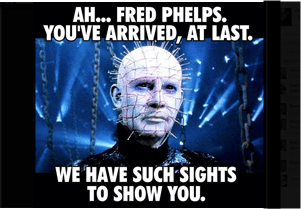 Daughter Margie Phelps told The Associated Press that Fred Phelps died shortly after midnight Thursday. That’s really all we need to know. Well my mother told me never to speak ill of the dead. So……..(ala Bette Davis). How nice. He’s dead! He was mentally ill. He lived a tortured and hate filled life. And apparently mental illness runs in his family. Now I wonder when and how his pathetic survivors are going to blame his death on gay people?